McNeese Crossing is locate in Union County, New Mexico. It is about 1/2 mile east of 406 in the upper NorthEast corner of New Mexico. Located where the Cimarron Cuttoff of the Santa Fe Trail crosses the Corrumpa Creek. McNees Crossing of Corrumpa Creek (which was once named McNees's creek) is 22 mi. NorthEast of the City of Clayton. From Clayton go 3.5 mi. EastNorthEast on US Highway 56/64; turn left (North) on NM 406. Go 18.8 mi. North to New Mexico historical marker on right (between mile markers 18 & 19). 50 yards North is gate/cattle guard on right. Drive East onto ranch property. NcNees is 0.5 mi. E. Be sure to close gate upon entry and exit! The first is from Josiah Gregg who traveled the Santa Fe trail in the 1820's. In this account he is talking about a wagon train that was heading back East from Santa Fe. The fall of 1828 proved still more fatal to the traders on their homeward trip; for by this time the Indians had learned to form a correct estimate of the stock with which the return companies were generally provided. Two young men named McNees and Monroe, having carelessly lain down to sleep on the banks of a stream, since then known as McNees's creek, were barbarously shot, with their own guns, as it was supposed, in very sight of the caravan. When their comrades came up, they found McNees lifeless, and the other almost expiring. In this state the latter was carried nearly forty miles to the Cimarron river, where he died, and was buried according to the custom of the Prairies. Just as the funeral ceremonies were about to be concluded, six or seven Indians appeared on the opposite side of the Cimarron. Some of the part proposed inviting them to a parley, while the rest, burning for revenge, evinced a desire to fire upon them at once. It is more than probable, however, that the Indians were not only innocent but ignorant of the outrage that had been committed, or they would hardly have ventured to approach the caravan. Being quick of perception, they very soon saw the belligerent attitude assumed by some of the company, and therefore wheeled roun and attempted to escape. Once shot was fired, which wonded a horse and brought the indian to the ground, when he was instantly riddled with balls! Almost simultaneously another discharge several guns followed, by which all the rest were either killed or mortally wonded, except one, who escaped to bear to his tribe the news of their dreadful catastrophe. "The Missouri Intelligencer of Franklin", Missouri, November 12, 1828. Two men, Monro and M'Nees were riding in advance on an east-bound wagon-train and on reaching the crossing of the creek soon to be M'Nees, dismounted and lay on the bank, awaiting the arrival of the wagons. A stream crossing was generally an accomplishment of all hands. Perhaps it was a warm afternoon, perhaps they were tired men. With nothing urgent on their minds, they fell asleep. Creeping up on the two figures, Indians gently lifted their rifles and, even as wagons came down the opposite slope, shot the sleepers with their own guns. McNees was dead on arrival of his companions. Monro was desperately wounded. No caravan was equipped to offer more than the roughest first-aid and sincerest good wishes. 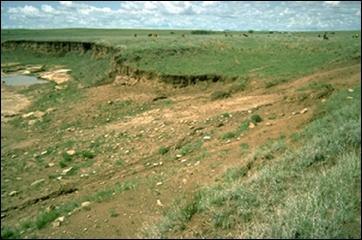 On that, Monro servived the rough thirty miles of Road to Upper Cimarron Spring (in Oklahoma panhandle). By then, from loss of blood, shock or infection, perhaps all three, he died. At the moment of burial at Upper Spring, six Indians approached. There was a moment of heated argument among the pallbearers but words were made superfluous by rifle fire from the lesser of wit. Five Indians lay dead and the chain of misunderstandings between Red and White was lengthened by another bloody link.